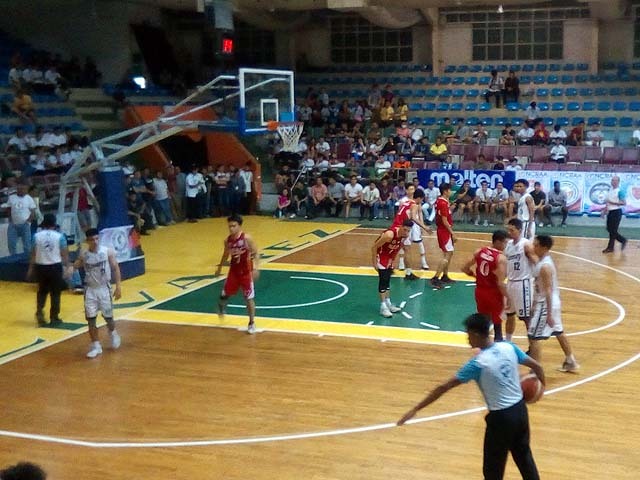 NCRAA26: Saint Francis d. Olivarez, 67-59 | Servinio's Sports Etc. Saint Francis (red) has dethroned Olivarez College as NCRAA Basketball Champions! PARANAQUE CITY – There will be a new champion in the 26th National Capital Region Athletic Association (NCRAA) after Saint Francis of Assisi College dethroned Olivarez College, 67-59, in the main game Monday at Olivarez College. The Doves had to overcome the hostile crowd with hard work anchored on an unforgiving defense as they also avenged their 64-65 defeat to the same side on opening day last November 27. Trailing by seven after the opening period, 15-22, the Doves turned up the defense in the second and limited the Sea Lions to only eight markers for a 42-30 halftime reversal. Kenji Manzanilla scored one more point than entire opposition and he drew support from reserves JM Cruz and Avi Arellano and the defending champions hardly recovered from there. A late Olivarez rally anchored on big men Vinny Begaso and Uduba hardly made a dent as the Sea Lions could not capitalize on the breaks accorded to them as they shot a horrific 23 of 83 clip from the field including several layups and tip ins. They further hampered their chances by missing 18 of their 30 free throws. Manzanilla led all scorers with 16 points and nine rebounds. Cruz followed with 12 points and 15 rebounds while Arellano chipped in 11 points and eight rebounds. Paulo Castro paced Olivarez with 15 points – 11 coming in their hot first period surge but was limited to four the rest of the way. Uduba was next with 11 points, 13 rebounds and four blocks while Begaso also had 11 points on top 10 rebounds but was thrown out late in the game for committing two unsportsmanlike fouls. The Doves’ victory sets the stage for an intriguing semifinal date with undefeated Centro Escolar University which advanced earlier in the day by besting De Ocampo Memorial Colleges, 76-72. The 26th NCRAA semifinals are set for Wednesday (February 13) at the Paco Arena. SAINT FRANCIS (67) – Manzanilla 16, Cruz 12, Arellano 11, Larotin 8, Chu 8, Cenita 4, Madrid 4, Ja Guevarra 4, Magsalin 0, Selorio 0, Jo Guevarra 0. OLIVAREZ (59) – Castro 15, Begaso 11, Uduba 11, Almajeda 9, Saguiguit 6, Rabe 4, Geronimo 2, Sala 1, Siegue 0, Completo 0, de Leon 0. Period Scores: 15-22, 42-30, 56-48, 67-59.